- Throw the sentimentality out of the equation. Pistons' president of basketball operations Joe Dumars made two glaring strategic mistakes re-signing Pistons' players from the "Going to Work" era to long-term deals. The worst was Richard Hamilton, but so was re-signing Tayahaun Prince. He just hasn't fit what they have been doing for quite awhile, although he may thrive on a contending team like the Grizzlies. 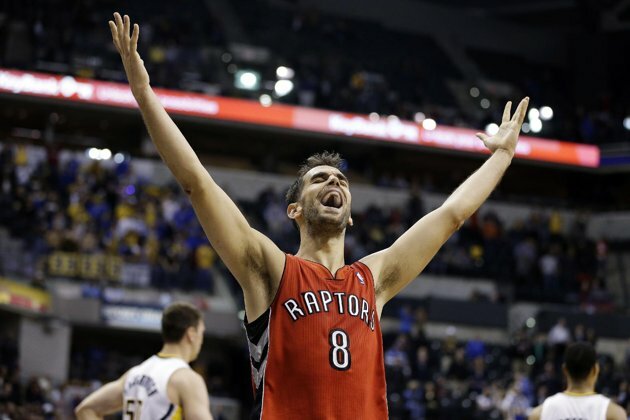 - Jose Calderon, is a good, solid NBA true point guard offensively, who is defensively challenged. He will help the Pistons make a playoff run. His expiring contract will help this summer, freeing cap space. He gives the Pistons more balance on the floor. - Rudy Gay would have fit the Pistons' biggest need. They need a genuine, NBA-caliber, big-time scorer from the wing or 2-guard spot. But he wasn't having a very good season and his contract is huge. Time will tell if Toronto, which has had the same issues, got the player the Pistons should have sought. - Despite their disappointing record, the Pistons have put some nice pieces in place. Andre Drummond is a tremendous addition, far better than could have been imagined, if he stays the course. His size-athleticism equation is off the charts, and he has adjusted surprisingly well to the tougher competition. Greg Monroe is a very good NBA player with inside moves, post-passing and persistence on the offensive boards. Brandon Knight will emerge as a quality combo guard, who will benefit the most from addition of Calderon in the short run. Kyle Singer is an excellent outside shooter, with respectable other aspects in regard to scoring, but who is limited in shot creation and defensively. A solid nucleus is there. - Still missing: The pure scorer to go to when they need a basket late in a tight game. Not inside, so much, as someone who can take it to the rack from the wing or the top and score or draw a foul. The best teams have those players. The really good ones, have a couple of them. It's still the missing part for the Pistons. It was particularly glaring in a recent loss to Chicago, as the Pistons blew a huge lead, and just couldn't stop the bleeding by creating points outside their offensive sets. But after a slow start, there is some progress being made despite back-to-back disastrous games. - The Pistons are 5 1-2 games out of playoff spot with 36 remaining. It would benefit their young players to win and taste a playoff series more than just living on the hope Pistons' stink and luck into a first overall draft pick. Calderon will help in that cause. At minimum, the deal provides flexibility for the future and the Pistons could have a bright one if they play their cards right. 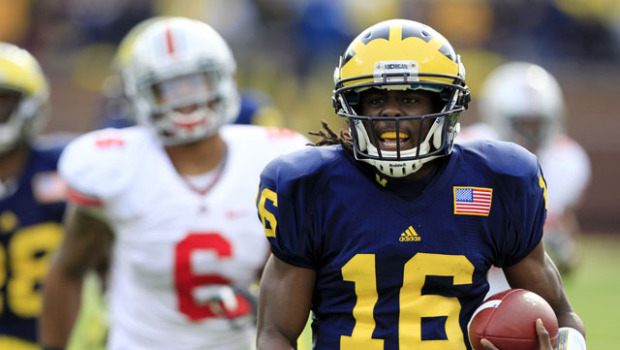 Denard Robinson wasn't exactly outspoken when he played quarterback for Michigan. The one thing he did say that raised eyebrows was claiming he could beat Usain Bolt in the 40-yard dash. Robinson has run the 100 meters in 10.3. He ran the 60-meter dash in 6.81. Both times border on world-class speed. But it will be his 40-yard dash time that will make or break Robinson's draft status. If he goes under 4.4, he could be drafted in the early rounds. If he runs in the low .4.4s, he will probably be drafted in the later rounds. If he is pushing 4.5 or goes above it, Robinson will likely be an undrafted free agent. He does have potential as a slot receiver. The evaluation of Robinson at the Senior Bowl was incomplete. He is still bothered by an arm injury. It was a strange play-call that had him running a reverse to his right when he is only able carry the ball in his left arm. He does have quickness and evade in the open field. His hands? That's all about work. Doubt that will be a problem. If Robinson is going to make it in the NFL, it is likely going to be out of the slot. 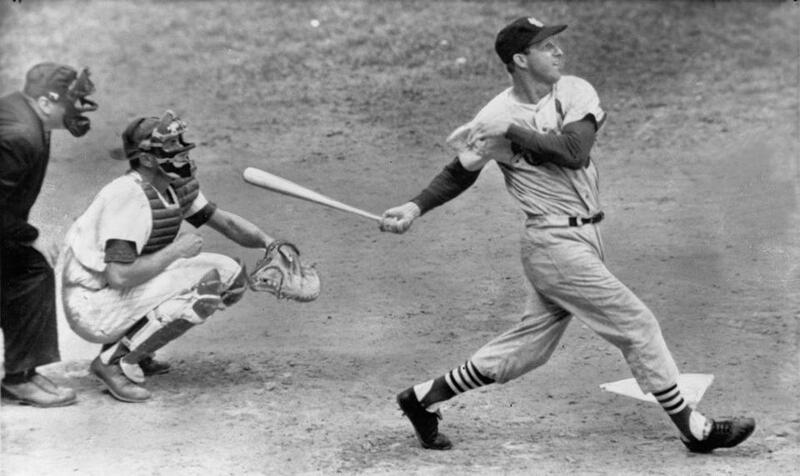 The idea is to catch the ball in stride and take off in that spot. It's doubtful he will be an outside guy, despite his speed, because of his small size. He could return kicks, but it was if the injury precluded that from happening at the Senior Bowl. A very comparable player in this draft to Robinson is Texas wide receiver Marquies Goodwin. An NCAA long jump champion and U.S. Olympian (he didn't medal in London), Goodwin has a similar speed-size equation as Robinson. Because of splitting his focus between track and football, Goodwin's football experience was limited to a degree at Texas (he was a starter and productive, but is still relatively raw). Goodwin got a much longer look at the Senior Bowl than Robinson. It was a mixed bag (he did show speed and hands on short patterns in the seams in the game, but also tried to catch a punt on the 1-yard line). 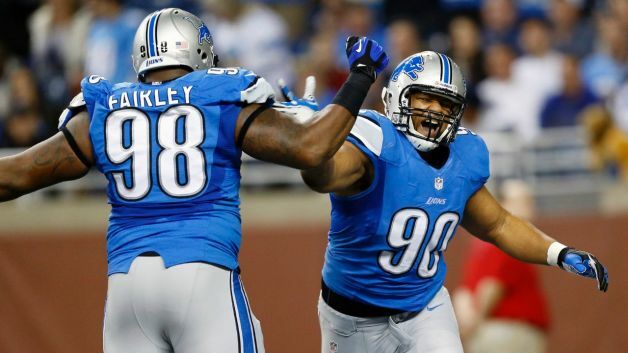 The Lions' off-season hasn't exactly gotten off to an ideal start. 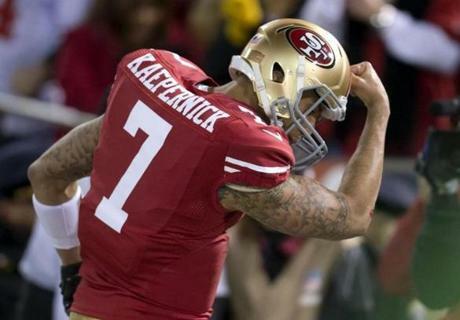 - He reportedly purposely lined up in the wrong position during a game and was sent home. - He embarrassed the team upon his return to practice with defiant behavior during drills and a brief, awkward media session. He was subsequently sent home again. - He recently took to Twitter and compared himself to Tupac as a martyr and complained about not getting the ball enough. Every day Young is a part of the Lions, considering the organization's issues last off season, and how they seemed to have a genuine bearing on an awful 4-12 season, the wrong message keeps getting stronger. Also, it was revealed by celebrity gossip website TMZ this week that forever self-promoting defensive tackle Ndamukong Suh will be on the reality TV show "The Dive." Yes, the 305-pound defensive tackle, who has garnered more schlocky TV appearances (he was on the dreadful dating show "The Choice" last off season), endorsements ("It's turkeylious"), headlines for traffic-related misteps ("I'm advising you to leave now") and run-ins with the league office ("What I did was try to remove myself best from the situation I felt in me") than quarterback sacks the last two seasons, will be hitting the high dive. Undoubtedly, "splat" will be the best way to describe his entry into the water. Three unnamed Lions players have been quoted by TMZ of criticizing Suh's appearance on "The Dive." Great. The Lions. TMZ. 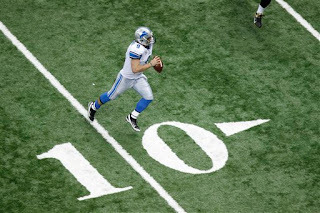 Why the Lions are, apparently, endorsing this, again sends an the wrong message. The Lions' organization from every level should be in the process of re-dedicating themselves to winning football games..
Young and Suh are mocking that notion and it is, frankly, embarrassing. 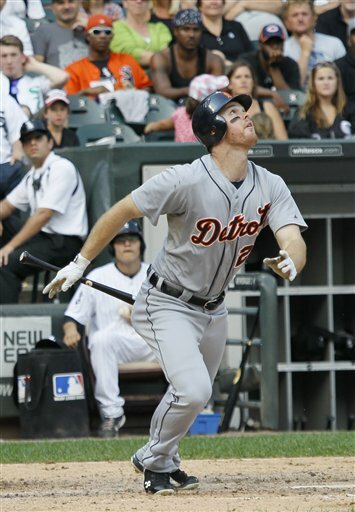 What do the Tigers do with Brennan Boesch? 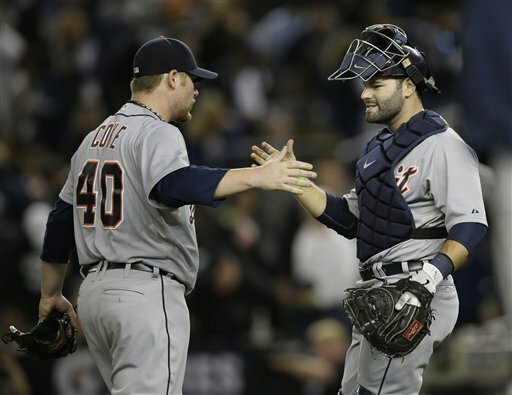 Any way you slice the opening day Tigers' roster, Brennan Boesch is not part of it. Andy Dirks is going to play left. If there is an extra outfielder, who hits from the left side of the plate, it would be more logical to use Quintin Berry because of his speed, and he is a better late-inning defender than Boesch. Or perhaps Don Kelly, who can also play infield, is a better defensive outfielder than Boesch, and he runs well (although not the base stealing threat Berry is). 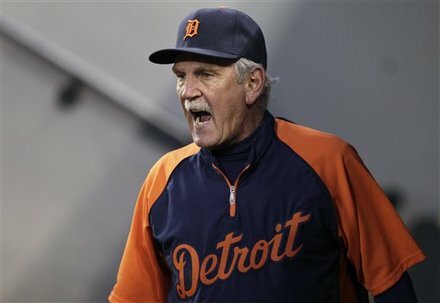 Do the Tigers just release Boesch? It would seem like wasting a player they have invested three years in, and who has, despite his many struggles, displayed stretches of an upside as a hitter. At $2.3 million, has Boesch (he was eligible for arbitration this winter) been priced off the trade market? 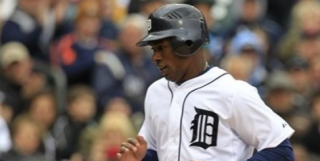 If the Tigers don't move Boesch before the start of spring training, he will be the most-scouted player on their roster this spring. It's difficult at this stage to see a scenario where he could play himself onto the roster short of injuries. When the first college basketball polls came out, Indiana was the consensus No. 1 team in the country. Maybe Cody Zeller has not been the dominant presence his press clippings suggested he would be, but he has certainly proved to be one of the best players in the nation, if not the best. Disappointment? Not really. IU lost an emotional game to Butler and a Big Ten game to better-than-anticipated Wisconsin. The Hoosiers haven't been disappointing. Michigan and Ohio State were also viewed as potential Top 10 teams in the preseason. They haven't disappointed. The Wolverines, in particular, have been impressive. 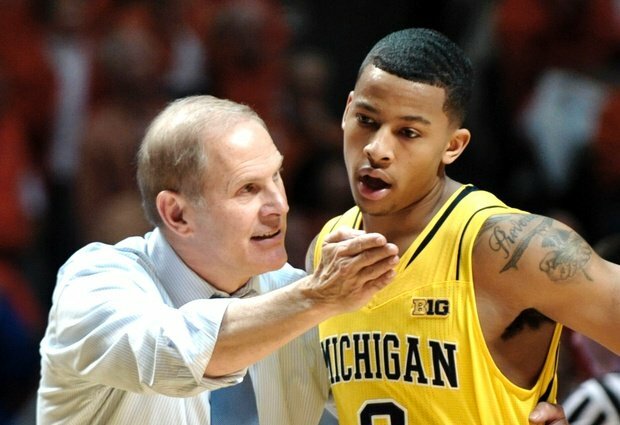 A 3-point shot from Trey Burke that went in and out at Ohio State away from being No.1, Michigan been better than advertised. Yet, Michigan State is 5-1 and alone atop the Big Ten standings, albeit because the Spartans have played an extra conference game. It was at home, rather than on the road, but the Spartans did beat Ohio State Saturday. They lost their Big Ten opener at Minnesota, and have kept winning since. Unlike Indiana (Zeller), Michigan (Burke) and OSU (DeShaun Thomas), MSU doesn't have a big star. Flash? Sizzle? Style? The Spartans have little in those areas. But it is nonetheless impressive the way the Spartans are winning. They are balanced in the floor, they crash the offensive boards and they play commando-style defense. In other words, Tom Izzo has gotten this team to fit into his classic mold relatively early. Logic dicates this will be the week the Spartans take a step back. Road trips to Wisconsin Tuesday and Indiana Sunday seem ominous for MSU, but don't be surprised if the Spartans survive by winning a game, or thrive by winning two, this week. Style point have never been a strength for the Spartans under Izzo. It's about winning. The Spartans, despite their success in the past, are being overlooked, but they bring a lot to the table. They do have an inside post game. Derrick Nix and Adreian Payne have developed nicely. His first two seasons, Keith Appling was a wild card game-by-game for MSU. Not any more. The leadership aspect and consistency have emerged. Branden Dawson and Gary Harris are excellent players. As such, it wouldn't surprise me if the Spartans are ultimately the last team standing in this conference. 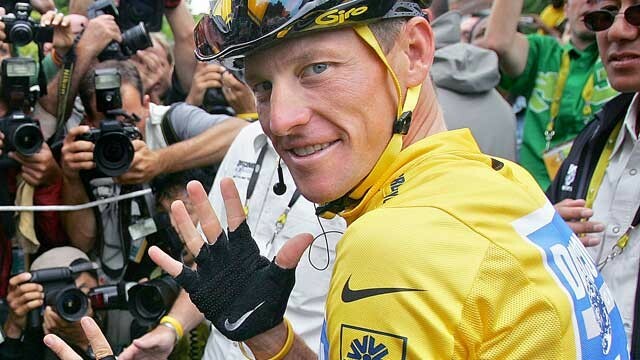 Unfortunately, tales of Lance Armstrong and Manti Te'o more "real" than "myth"
The NHL is back, so why not enjoy it? Trade rumors swirl in baseball like wind during a tornado. Most of the speculation doesn't actually transpire. Yet, it is a reasonable premise the Tigers, despite an upside that is often ignored by impatient fanbase, might trade right-handed starting pitcher Rick Porcello. They have six starting pitchers and only five spots. Drew Smyly did well last season as a rookie. Porcello mostly struggled. 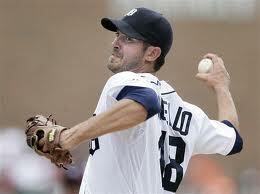 Smyly is left-handed, and would be the only lefty in the Tigers' rotation. Porcello doesn't seem like a good fit for the bullpen, and at 24, it would be holding back his growth. There have been two trade scenarios involving the Baltimore Orioles and Porcello fans and media have been discussing lately. 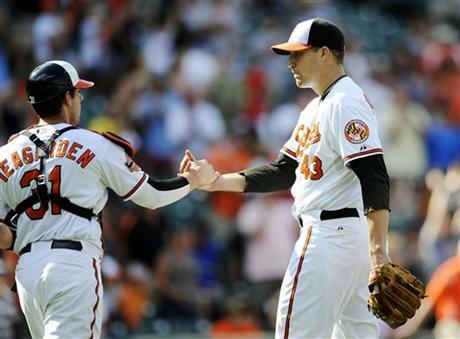 The first has Porcello as part of a deal for shortstop J.J. Hardy, the other has Porcello moving for closer Jim Johnson. I wouldn't trade Porcello for Hardy. I would for Johnson. Hardy would be an upgrade defensively at shortstop for Jhonny Peralta, whose lack of range is often maddening. Hardy and Peralta are similar players offensively, although I don't know if Hardy's numbers would fall playing home games at Comerica Park compared to the bandbox in Baltimore. They are at essentially the same stage of their respective careers. Do I think it would be an upgrade to have Hardy? Yes, but not dramatically. Also, the most under-publicized prospect in the Tigers' minor league system compared to what the front office actually thinks about its players is shortstop Eugenio Suarez, who will likely find himself at Double-A at some point this season after a breakout season at Class A West Michigan in 2012. The Tigers are viewing Peralta as a one-year gap, and if Suarez doesn't develop, then they will look elsewhere. It's a scenario that would make dealing Porcello for at this point unwise. Johnson, on the other hand, did have 51 saves last season. Closers, by nature, are iffy to project season-to-season, but Johnson had a good track record as a minor league starter (I like that with closers because it means at some point they had to learn how to pitch rather than just throw or over-rely on a certain plus "out" pitch). 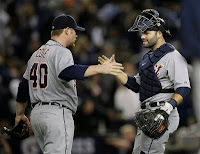 Johnson has performed well the last two seasons, is in his prime, and would likely serve as the final piece to put the Tigers, already on paper the best team in the American League even with a huge question mark at closer, over the top. But why would the Orioles, who fancy themselves as contenders, do it. It seems like the AL East is wide open. The O's should be going for it, too, after making the playoffs last year. ﻿﻿﻿﻿When Denver’s Peyton Manning threw an interception in overtime to essentially lose a playoff game Saturday to the Ravens, and then the Patriots’ Tom Brady carved up the Texans the next day, it sealed what we’ve pretty much suspected all along. Brady is the best quarterback of this generation. While it has been eight years since New England’s last Super Bowl title, the Patriots just keep knocking at the door. Denver has a good defense, but is lacking quality safety play. That isn’t a problem for the Patriots. This will be Ray Lewis’ swan song, and another celebration of Brady’s greatness. One of the trite things being said about Michigan's 56-53 defeat at Ohio State Sunday is the Wolverines will somehow benefit from the loss, that it was a learning experience that will prove valuable down the road. I couldn't disagree with that premise more. Michigan's basketball program, often a source of embarrassment, and at times neglect, since the 1990s, would have vaulted to No.1 in the nation with a victory. So that wouldn't equal a regular season Big Ten title, or a Big Ten Tournament championship or a Final Four appearance or winning it all in the NCAA tournament - it would have been particularly meaningful for the Wolverines. 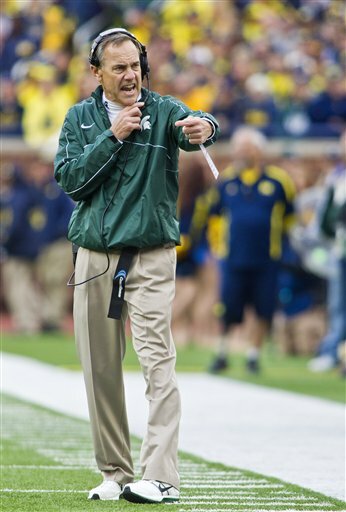 It also would have been a source of extreme annoyance for Michigan State fans, who are itching for a time the Spartans might be the one that prove Michigan is overrated. Personally, I don't believe the Wolverines are overrated. I thought Sunday's game was telling about Michigan's competitive character. That was a tremendous rally from being down by a wide margin on the road in an extremely hostile environment. If Trey Burke's late 3-point shot had gone instead of in-and-out, the result would have been different. Michigan has good balance on the floor and is athletic, but this is still a team coached by John Beilein. That means the Wolverines must shoot the ball better in order to be a force. Burke and Tim Hardaway Jr. were a combined 9-for-29 shooting. Freshman super shooter Nik Stauskas only got off three shots, missing them all. The Wolverines will not win against top competition if they don't shoot much better. They were in the game, though, despite it all. It was a good sign, but not a great one. That would have been winning and being able to claim the top spot in the polls. 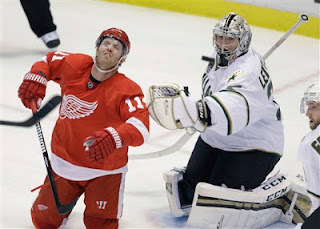 Replay of my live chat Monday on Michigan's loss to Ohio State, NFL playoffs and Red Wings. We do this every Monday at 1 p.m.. Check out and take participate. The NFL flavor of the day: college coaches. But why? The NFL is the ultimate copy cat league, and because Jim Harbaugh went from Stanford to have stunning immediate success with the 49ers, and Greg Schiano left Rutgers and presented a solid base, if not a very good record (9-7) at Tampa Bay, all of a sudden you see NFL teams looking at college coaches to fill head coaching vacancies. Part of this is a dearth of quality of NFL assistant coaches ready to move up the ranks, but come on, isn't this getting desperate? Oregon's Chip Kelly, for example, runs a mad scramble offense that isn't remotely like anything present or past would or actually work in the NFL. He has nothing resembling the NFL on his resume and his big stop before Oregon, where there was a very solid base when he moved there, was New Hampshire. 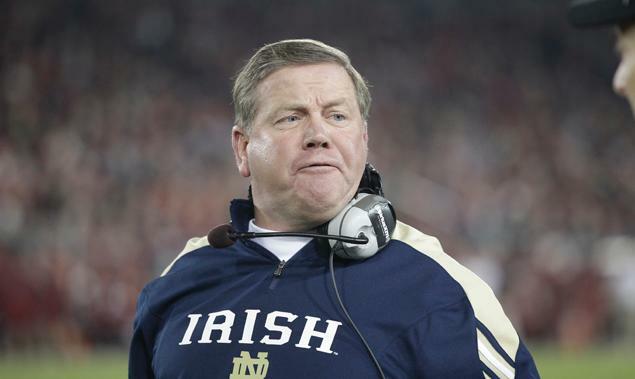 Notre Dame's Brian Kelly, interviewed by the Philadelphia Eagles, worked his way up the ranks from Division II Grand Valley State. He, too, has no NFL pedigree. I understood the idea of Penn State's Bill O'Brien as a head coach because of his NFL ties. Ditto for Syracuse's Doug Marrone, who was named head coach of the Bills. But head coaches with no NFL background at all? Harbaugh was a very good NFL QB. Schiano spent three years in the late 1990s as a defensive assistant with the Bears. Also, look at the busts among NFL coaches from the college ranks down through the years: Nick Saban, Steve Spurrier, Mike Riley, Bobby Petrino. The list, honestly, is endless. - Baltimore at Denver: Peyton Manning is one of the football’s all-time great players, and definitely keyed the Broncos’ climb to NFL elite status, but it is often forgotten Denver won a playoff game last year with throwing-challenged Tim Tebow at quarterback. Why? Defense. This time that defense could carry the Broncos to the Super Bowl. It will be the difference in this game. Denver 28, Baltimore 14. 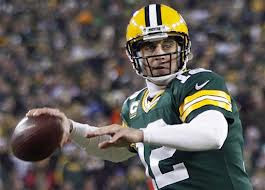 Aaron Rodgers: Is he the best player in the NFL? - After nearly eight months off for many of its players, the NHL is planning to cram 48-game schedule in after just eight days of training camp. - There reportedly will only be games played within the conference. 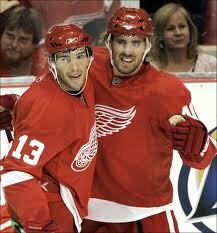 For Red Wings' fans, that will mean a lot of the Columbus Bluejackets. Yippie. - There is little time for teams to tweak their rosters. 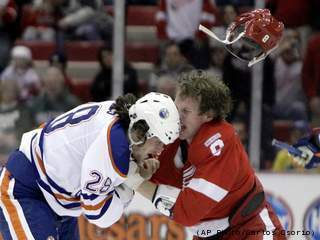 It will be a mad scramble to play what figures to be dreadful hockey to begin the "new" season. - The Winter Classic, the league's marquee event, has come and gone. - With NBC building its sports network around the NHL, and actually showing genuine interest in putting the NHL on its big network, the league had finally started gaining momentum in this country. That momentum will be essentially gone upon the league's return. - It will skew the Stanley Cup playoffs. - What a gutsy call by Brady Hoke to go for it fourth and one in Michigan territory. But why not? What do the Wolverines have to lose by gambling today? Nothing. But they can win a lot of cache with an improbable victory over a solid SEC team. - Those were great plays by Devin Gardner on Michigan's TD drive in the third quarter, two on runs, and that was a terrific throw on the TD pass. - Michigan is not going to be a true national force until Hoke recruits a really good running back.It's been bad all season, but has truly got ridiculous since Fitzgerald Toussaint has gone out. - This is a terrific football game. Michigan is hanging tough, and to be honest, I thought the Wolverines would get clocked by South Carolina. - On Michigan's TD drive, that was the best I've seen Devin Gardner play in a certain sense. This is a truly good defense Michigan is facing today, not Minnesota, Northwestern and Iowa, and he made some big-time throws on the drive, particularly the one that netted a TD. Best sign yet from him. But he is lacking some consistency with passing. He needs to be more consistent and accurate. I would expect that come after a full off-season as the No.1 QB. - The Wolverines' biggest strength is their linebackers. Michigan defensive coordinator Greg Mattison is playing to that strength by crowding the line of scrimmage. 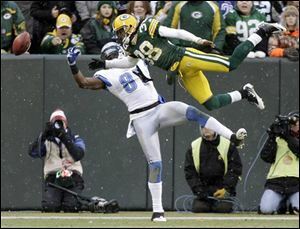 But the downside to such aggression is it can lead to getting burned by big plays down the field. It's happened twice already to the Wolverines' defense. Yet, it's their only chance. - The most underrated Michigan recruit from the Rich Rodriguez era was wide receiver Drew Dileo. He does a lot of good thing to help the Wolverines win football games. - How many eyebrows were raised when Jon Gruden referred to Michigan's Al Borges as the top offensive coordinator in the country? Whoa. I've defended Borges over much of the ridiculous criticism he has received while working under circumstances with players who are limited, but I do agree that was an overstatement by Mr. ESPN Quarterback Camp. - We've learned already that Devin Gardner is not much better, if any, than Denard Robinson when it comes to ball security. We've also learned he isn't nearly the same caliber of runner. Robinson's extraordinary footspeed is the only thing that has often kept the Wolverines in games down through the years. It has given them a shot in the arm today already. He is still their big hope offensively. Doesn't bode well for the future, does it? - I come from the school of thought that Michigan's football uniform is among the most perfect in all of sports. As much as I love the "combat" and "retro," or whatever you want to call them, uniforms, Michigan is the one school that doesn't have to go that route. But having said that, their unforms today are just fine. My only complaint. It's very difficult to read the numbers in maize. At least the names on the back of the jerseys are in blue. - Taylor Lewan is helping his draft status a great deal so far in this game by holding his own against South Carolina's great Jadeveon Clowney. But it's early. The key is to not fall behind by too many points. 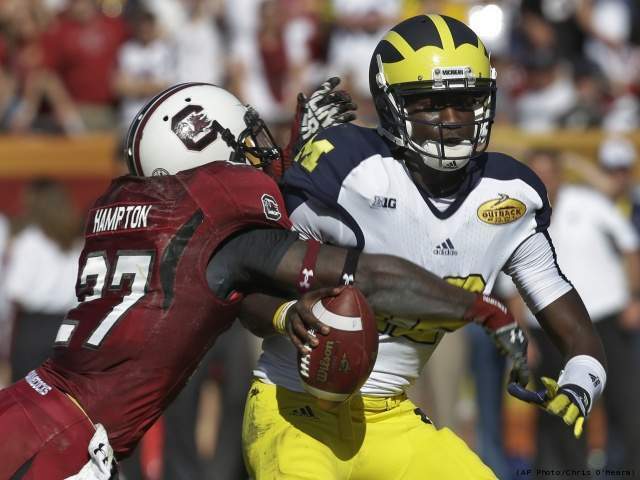 Clowney will take over this game if Michigan is down by a few scores and everybody knows the Wolverines must pass. If it is a close game, Clowney will be much more off-balance and it will hinder his ability to just charge forward on the pass rush.